WELCOME TO ELITISM6.COM: Students braces for the worse as ASUU embarks on 1 week warning strike. 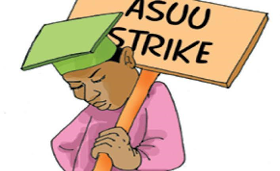 Students braces for the worse as ASUU embarks on 1 week warning strike. Federal Government to implement the 2009 Agreement and 2013 MoU. during a press conference organised by the union. state of our agreement,” he said. eight per cent in 2016.
handled by the Tertiary Education Trust Fund (TETFund),” he said.